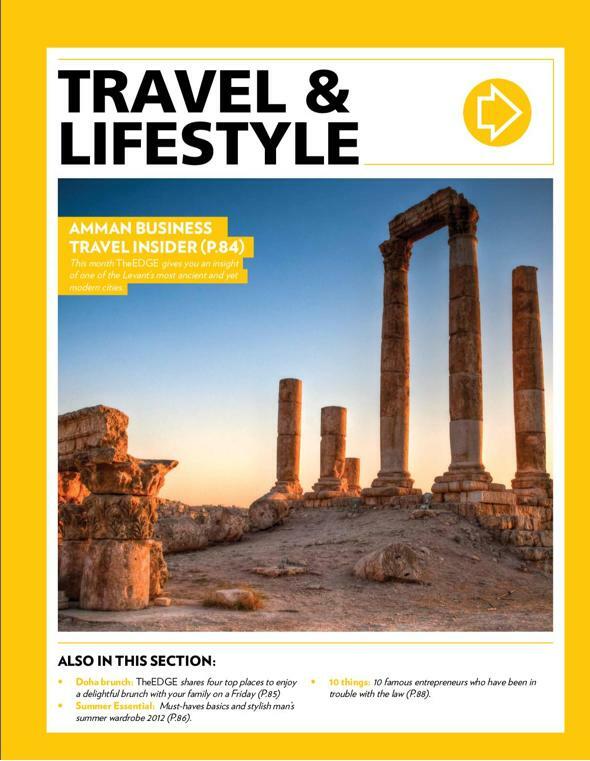 Business magazine The Edge have just launched a new opinion column, “Qatar Perspectives”, and I have the honour of being their first guest columnist. My chosen topic – the huge challenges many women in Qatar face if they choose to pursue a career. Do you agree with me? Footnote, 2017: The Edge has deleted a lot of its website content – so here is the full text of the column. There’s a lawyer I know here who works as a swimming teacher. I also know a physiotherapist working as a nursery teaching assistant, an engineer who’s an admin assistant, and a midwife not working at all. They have three things in common – they’re all expat “trailing spouses,” they’re all mothers, and they’ve all taken jobs far below their qualification level and usual salary – if they’re working at all. Expat women sponsored by their husbands are legally allowed to work in Qatar, but they face a range of hurdles in their race to climb the career ladder – or even, to be frank, to cling to the very bottom rung. 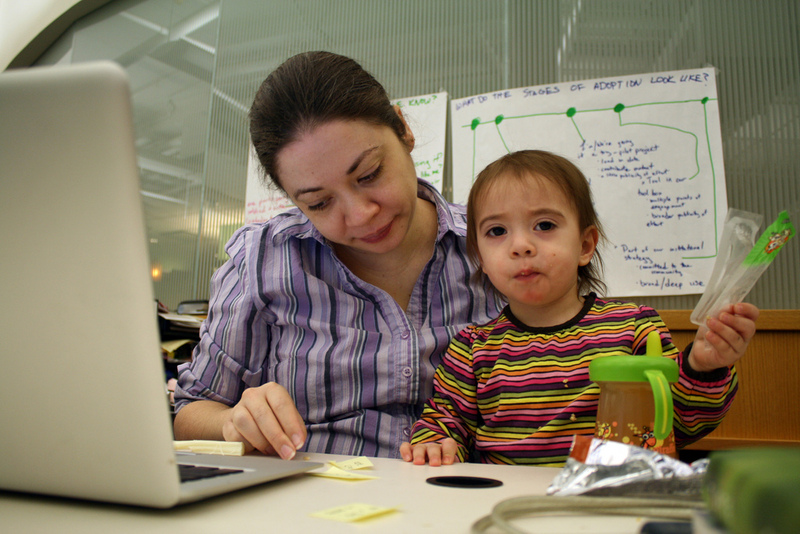 These include childcare, sponsorship laws, and a lack of flexibility. To get around them, many choose jobs that guarantee long holidays and shorter hours, often for low salaries and in areas unrelated to their particular expertise. Although sponsorship is not an issue, many Qatari women also find it hard to balance their careers with family life. Although they make up the majority of local university graduates, only 35 percent of female nationals work. Recent research by Wamda concluded that this group also wants more flexibility, and different childcare options, demonstrating that, whether Qatari or expat, working women here share a desire for change. I believe that it’s primarily childcare issues which are holding these women back. At the heart of the problem is a disconnect between school hours (around 7.30am – 1.30pm) and average working hours (8am – 5pm up to six days a week – and that’s being generous.) Add lengthy school holidays to mix, and you’ve got big childcare gaps to fill. “Get a maid!” I hear you cry. It’s certainly true that a full time live-in maid is an affordable and convenient option, but it’s not for everyone – me included. Some families prefer not have a member of staff living in their home (live-out, unsponsored maids are illegal), and many more don’t have the room to accommodate one. And even if you have a maid, there’s the difficulty of school runs. Working parents often rely on taxis, minibuses or (often illegal) drivers – not an option everyone is comfortable with. Qatar’s limited maternity leave of 50 days also puts many women off, and nursing mothers face a quandary too – under Qatari labour law, they’re given one hour off per day to nurse their infants for a year, but this assumes their baby is nearby, or that they have the use of a pump and privacy at the office. For expats, the Kafala sponsorship system is also part of the problem. Part-time work and job shares are an appealing solution for many, but sadly, they’re pretty much unheard of here. Although a local-hire expat spouse is “cheaper” (only one half of a couple can receive allowances) it seems that many HR departments simply aren’t ready to relinquish control. Many insist on sponsoring even part-time workers, an option some are uncomfortable with, given the control over exit permits, annual leave and NOCs that this gives their employer. Many women also report that salaries are very low, as employers expect them to be “looked after” financially by their spouse. Some would also like to peripatetic career, but this is also tricky. Expat spouses need to register as “working women” with the government, and this process assumes that they only work with one employer. Qatar currently has no registration process for freelance workers. Others choose to set up businesses from home, offering services like cake making and hairdressing – and as inoffensive as these businesses are, they’re all illegal under Qatari law, which requires all registered companies to be 50% Qatari owned and run from an office. So, what to do? I’ve canvassed opinion amongst both working and non-working women in Qatar. They’d like “wrap-around” care at schools, provided by trained staff; longer maternity leave; workplace crèches; flexible working hours for school runs; agencies offering live-out, licensed, trained nannies; and the establishment of a “licensed childminder” scheme for out of school hours care in a home setting. They’d also like job-sharing to be an accepted option, and freelance work and small businesses to be officially endorsed by the government. After all, nobody wants to break the law just to work for a living. If just a few of these suggestions could be made law, I believe Qatar would benefit exponentially from the expertise, enthusiasm and experience that presently unemployed women could provide. After all, as Qatar moves towards a knowledge-based economy, doesn’t it make perfect sense to make the most of the skilled workers who are already here, just waiting for an opportunity to show what they’re worth? 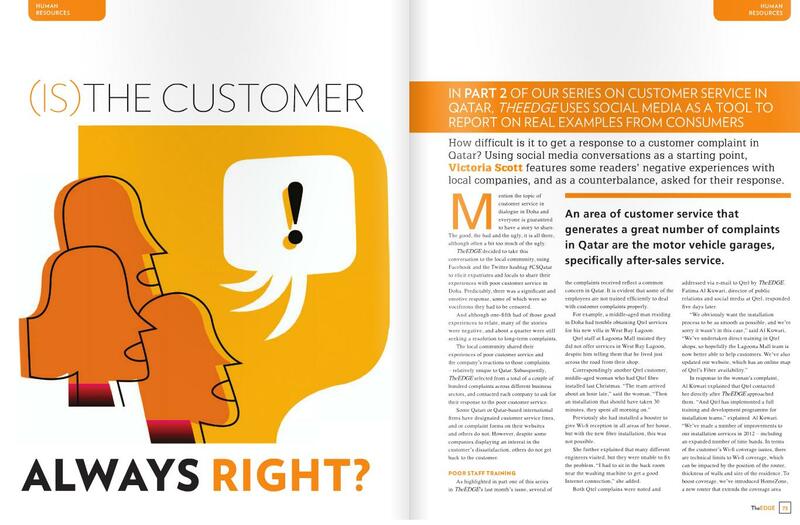 In this month’s TheEDGE, I tackle a common bugbear amongst Qatar’s residents – the standard of customer service. You can read the article here. In TheEDGE’s Ramadan issue, I write their “10 things” column on the back page. 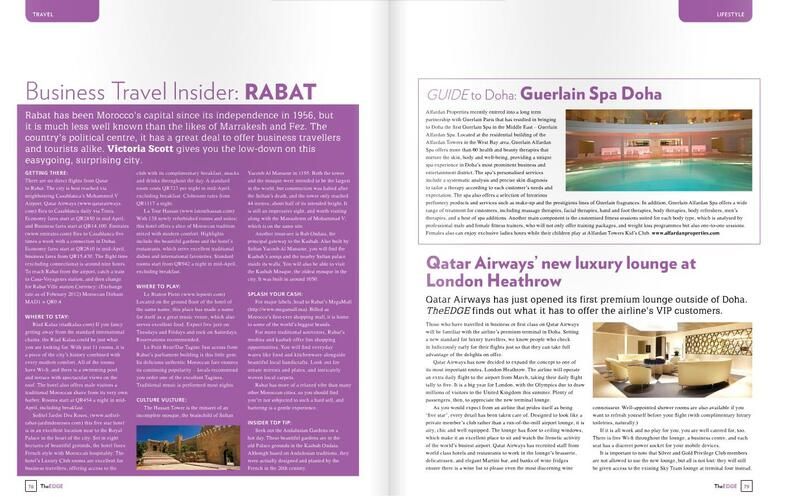 This month, I offer my tips on how to enjoy Doha during Ramadan, the Muslim holy month, whatever your faith. Click here to read the article. 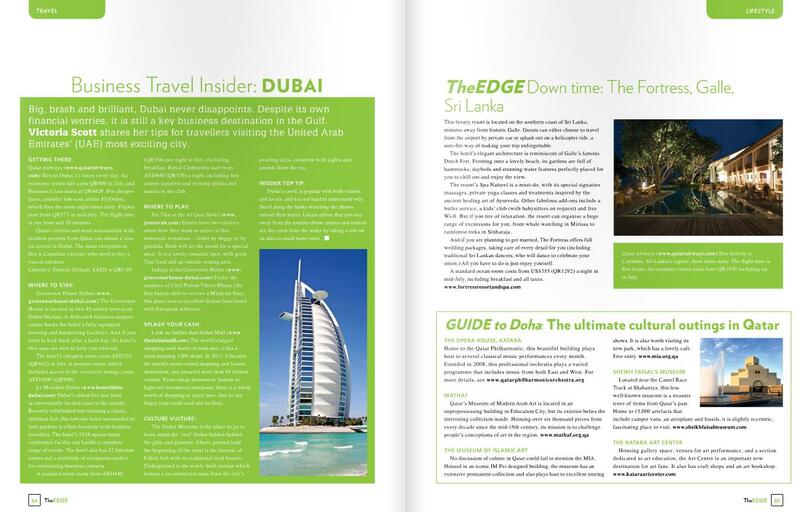 In TheEDGE’s Ramadan Issue, I offer my tips for Dubai business trips, review the luxury haven that is The Fortress in Sri Lanka, and showcase Qatar’s ultimate cultural outings. You can read the articles here. 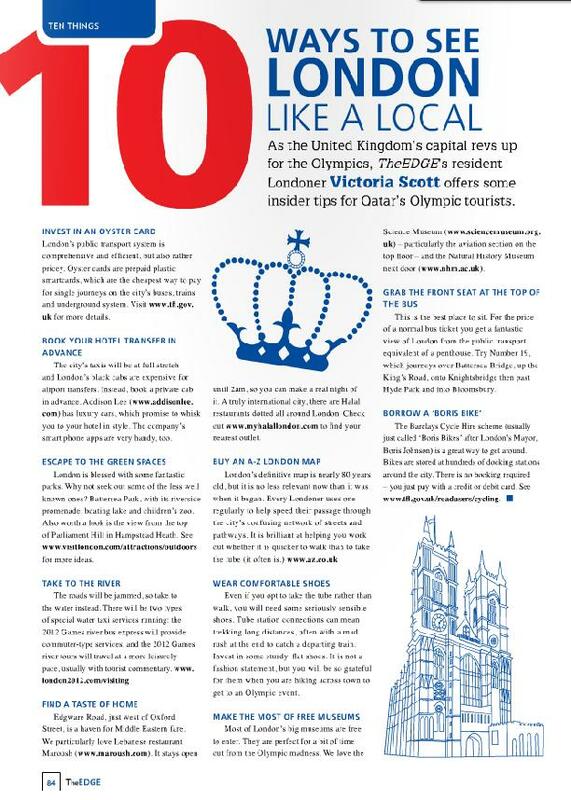 In this month’s edition of The Edge, I’ve written a guest column for their “10 things” section on the last page. It’s my tips for those planning to fly to London for the Olympics. Click here to read it. 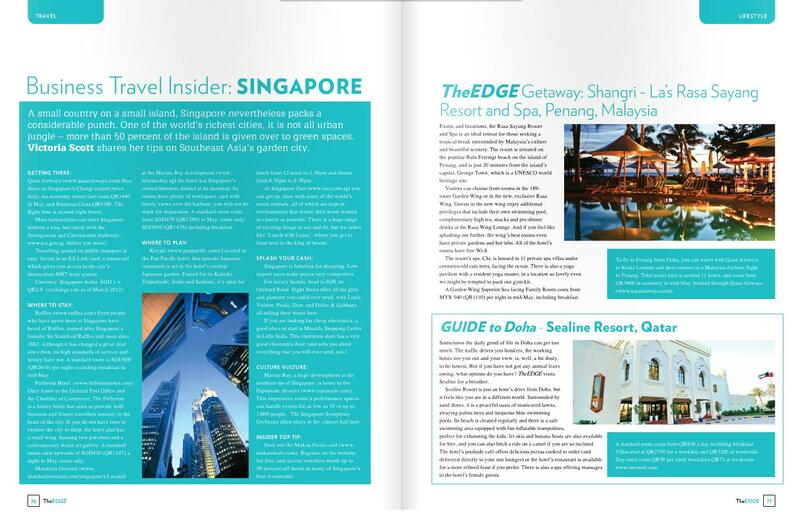 In TheEDGE this month, I give my business travel tips for Singapore and review the Rasa Sayang Resort in Penang and Sealine resort in Qatar. Click here to read the articles. 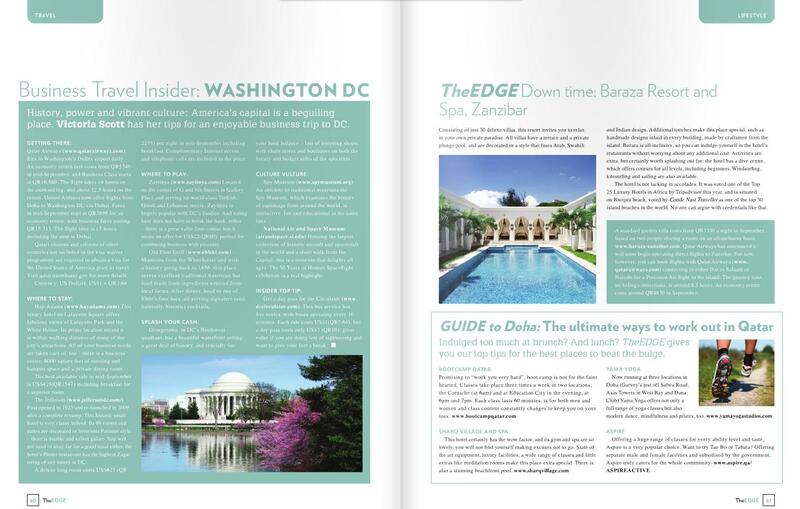 From me in TheEDGE this month: business travel to Amman, the best brunches in Doha and the paradise that is the Four Seasons Seychelles. Enjoy. Click here to read the articles, or see below. 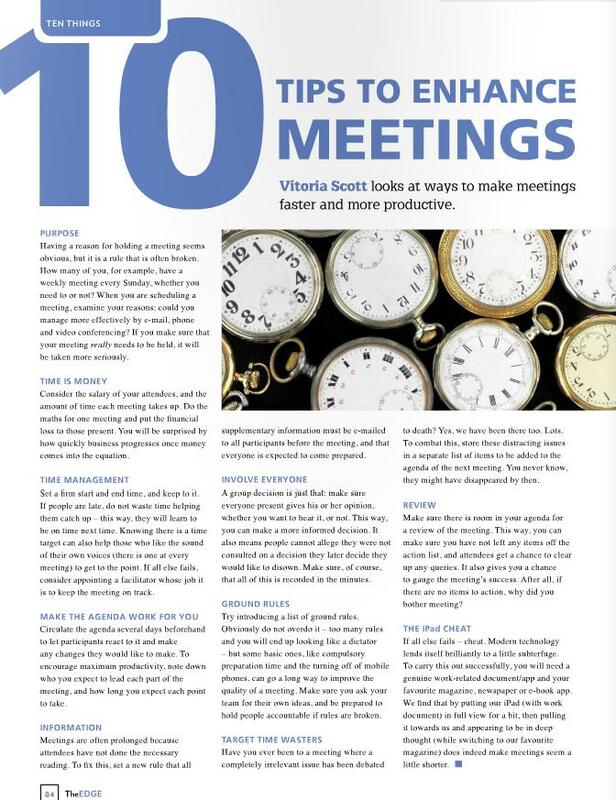 In The Edge this month, I give tips on how to make good meetings more effective, and dull meetings go faster. Click here to read the article.